Limiting my fully packed rucksack’s weight to 20lbs (9.07kg) is challenging me. I will have to revise my Kit List down further to stay within that limit or increase the weight allowance. Revise the list down I think. I’ve replaced most of my equipment with the lightest alternative, yet the weight, as I write, is 18.7lbs (8.5kg). That is before stowing the final few items including food though. There is still scope to save a few ounces here and there - with the relevant software I could print out some map sheets rather than carry the OS Explorer Maps for instance. I'm considering MSR’s PocketRocket Stove (or a Primus), Titan Kettle and Cup. I haven’t bought them yet so the weights shown on my spreadsheet are unverified. I may do without the cup. There were one or two lighter options for some of my new things but the cost was prohibitive for me. No, I will have to take less. I could do some creative accounting. For example, moving walking poles (see my spreadsheet) from the “rucksack” to the “worn” category would save me 1lb 4oz (575g). My own version of “quantitive easing”. I think not. It seems to me that the problem stemmed from a wish to take more spare clothes. Touristly - I arrive at a night stop, shower, change into some glad rags and go down the pub. It’s feasible; The Cleveland Way is not a wilderness walk. Bryn and I will use bed and breakfasts as well as tents. So cut the pub or don't dress for the ball. Methinks - a wash, the pub? Yes, definitely, but less sartorial. Spare footwear is included in my kit list but the weight is not accounted for yet. I would like to take them but my North Face Hedgehogs, UK size 10, weigh in at 2lbs 1oz (940 grams). On-line searches reveal lighter makes, however, the choice is bewildering. I’ve decided. It’s a compromise (not a cop-out). The 20lb limit applies to everything including food and water but I can exceed that weight to accommodate spare footwear. Hedgehogs, for the time being at least, you’re coming with me. Hedgehogs - A temporary reprieve? 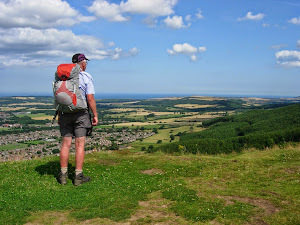 I am also walking the Cleveland Way with my son(aged14) in July. Last year we walked Hadrian's Wall. We also plan to hike with backpacks, camping and cooking our own food as well as eating in pubs. We are actually carrying 35litre backpacks, the idea that anything bigger will tempt us into taking even more gear! It is quite hard but not impossible. Good luck. Thank you for your comments Sam. I walked The Cleveland Way with my son when he was aged 15 (at my request). We are walking it again 20 years later (at his request). Hope you get the same chance with your son.